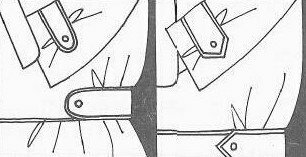 ornamental and functional part of a garment which is in the shape of a belt, triangle or another shape with a point, and is located on the sleeve, collar, the lower part of trousers, etc. Fastened by means of a button or buckle, which reduces the size of the opening. Typically used in sports- and workwear.